Antonov, or Antonov Aeronautical Scientist/Technical Complex (Antonov ASTC), formerly the Antonov Design Bureau, is a Ukrainian aircraft manufacturing and services company with particular expertise in the field of very large aircraft construction. Antonov ASTC is a state-owned commercial company. 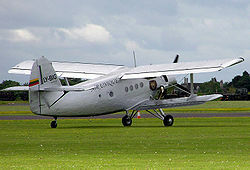 The company is named after Oleg Antonov, its founder and head designer of An-2, An-24, An-22 and other legendary planes. The Antonov company lacks facilities for full construction of some aircraft, a result of Soviet industrial strategy that split military production between different regions of the USSR. This distribution minimized potential war loss risks. As a result, Antonov airplanes were often constructed by aerospace companies in Kharkiv (Ukraine), Novosibirsk (Russia), and Tashkent (Uzbekistan). Trolley bus construction and manufacture (a spin-off, using existing technical expertise). Air Start project. Satellite launch from the modifed version of Ruslan. Antonov's airplanes (design office prefix An) range from the rugged An-2 biplane (which itself is comparatively large for a biplane) through the An-28 reconnaissance aircraft to the massive An-124 Ruslan and An-225 Mriya strategic airlifters (the latter being the world's heaviest aircraft with only one currently in service). Whilst less famous, the An-24, An-26, An-30 and An-32 family of twin turboprop, high winged, passenger/cargo/troop transport aircraft are important for domestic/short-haul air services particularly in parts of the world once led by communist governments. The An-72/An-74 series of small jetliners is slowly replacing that fleet, and a larger An-70 freighter is under certification. The Antonov An-148 is a brand new short-haul airliner of twin-turbofan configuration, which is awaiting Western certification. Over 150 aircraft have been ordered since 2007, all of them by Russian and former East-bloc operators plus Cuba. A stretched version is in development, the An-158 (from 60-70 to 90-100 passengers). Antonov Pictures and Antonov for Sale.